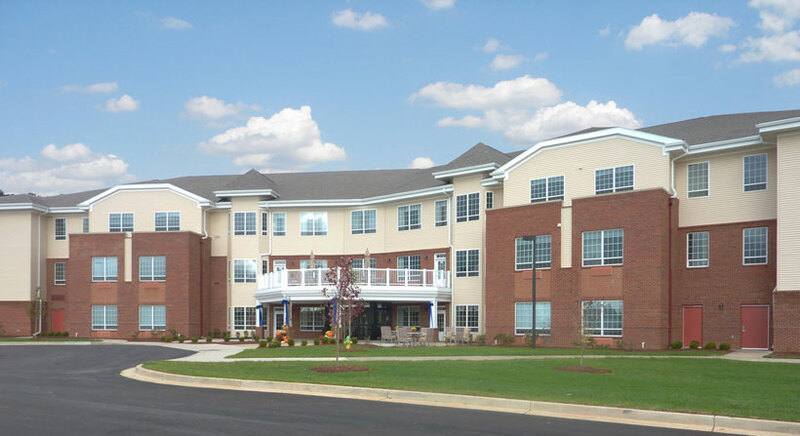 Childress & Cunningham is pleased to announce the grand opening of Bridgepointe at Village Manor, the latest jewel in the crown of the extensive facilities at Christian Care Communities’ Bowling Green campus. This 70 bed, 68,000 square foot facility showcases Childress & Cunningham’s Small House concept of senior living, with residents living in six distinct neighborhoods. The neighborhoods create a home-like atmosphere through the elimination of long institutional corridors, the use of individual architectural elements and decorating, and a neighborhood “kitchen”, living and dining room. These neighborhoods subdivide the large facility into living spaces that are scaled down to serve twelve residents. Different neighborhoods incorporate Assisted Living, Memory Care, and Short-Term Skilled Nursing Care. The efficiency of a large facility is not lost however, as these neighborhoods all connect to a central core of services, where staff can move behind the scenes to serve the residents in an optimal manner. For example, residential scale serving kitchens within each area link to and augment the main commercial kitchen while providing a more home-like environment at mealtime. We are excited to bring to fruition this state of the art concept for elder care to our clients. The Small House offers the perfect synergy of large scale efficiency for the owner and home like comfort for the residents. Posted in Commercial Elder Care Multi-Family .